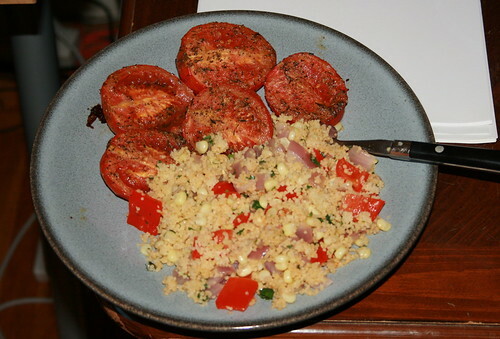 Dinner this week was based around one of my new favourite dishes: a couscous salad with corn and red pepper. I first made this earlier in the summer and fell in love. It’s pretty forgiving – though this last time it needed just bit more spice. I overcompensated a bit for putting in too much cayenne last time. Oh well. Read on beyond the jump for a recipe that convinced my father that couscous wasn’t always a big, gloopy mess. An easy dish that comes together really fast, especially if everything is chopped ahead of time. The ingredient list below is for 2 servings. For 4 people, I used 4 ears of corn (what? I like corn), a huge red onion (and the onion was still pretty noticeable), one large red pepper, and a cup of couscous (5 servings). Next time, I’d probably use another red pepper, lose one ear of corn, and add cherry tomatoes to the dish instead of roasting on the side. I did that once and I thought it turned out really well. Basically, alter the veggie content to match your tastes. In a heavy skillet heat 1 tablespoon oil over moderately high heat until hot but not smoking and sauté corn, stirring, until golden. 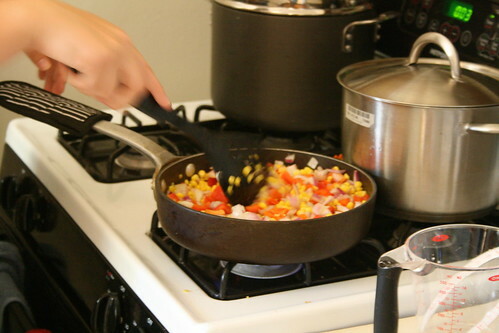 Add onion, bell pepper, garlic, cumin, and 1/4 cup water and cook over moderately low heat, stirring occasionally, until bell pepper is crisp-tender. While vegetables are cooking, in a small heavy saucepan bring remaining cup water to a boil and stir in couscous and salt to taste. Cover pan and remove from heat. Let couscous stand 5 minutes and fluff with a fork. In a bowl whisk together lime juice, remaining tablespoon oil, and salt to taste until emulsified. Add vegetable mixture, couscous, cilantro and cayenne and toss to combine well. I think this turned out pretty well for a first-time dish. Next time, I’ll add red chile pepper flakes for added kick and double the lime. However, I’m not sure that won’t be too hot for everyone’s tastes, so I’ll list recipe as is. For our vegetarian, I sauteed a huge portabella mushroom cap in a bit of olive oil and served with a dollop of the butter. Ruth ate it all and pronounced it “good,” so I hope that really did work out for her. 6 (5- to 6-oz) pieces skinless white fish fillets (recipe calls for tilapia or bass; neither was available to me, so I used cod). Stir together butter, shallot, zest, lime juice, chile, and salt in a bowl. Heat 1 tablespoon oil in a 12-inch nonstick skillet over moderately high heat until just smoking, then sauté 3 pieces of fish, turning over once with a spatula, until golden and just cooked through, 4 to 5 minutes, and transfer to a plate. Sauté remaining fish in remaining tablespoon oil in same manner. Serve each piece of fish with a dollop of chile lime butter. Usually, I roast plum or roma tomatoes. On Sunday, the heirlooms were sooo gorgeous that I quartered a few and used those. Very pretty in the pan, but a big ‘ol mess on the way out. You really do need to use small tomatoes with pretty tough skin. Next time I’ll go back to using roma. Preheat oven to 375ºF. Place tomatoes cut-side up on a baking sheet sprayed with Pam (or a glass dish). Mix a little olive oil, the salt, pepper, and seasoning in little bowl. Brush over the tomatoes. I like to be able to see the seasoning on every tomatoe, so really – this is a big “season to taste” recipe. Roast for 40 minutes (or until the skins are wrinkled and a little blackened). *Some photos from previously cooked dinners.